(Nanowerk News) Imagine the frustration of studying blueberries for months, and never getting to eat any! That’s the situation Davidson student scientists have faced this semester in the new era of genomic research. Nine students who are involved in a multi-institutional effort to produce better blueberries only see the fruit as codes, symbols, numbers and letters on computer screens, rather than the nutritional, sweet treat they love. The Davidson students are part of a project to annotate the blueberry genome in undergraduate classes. It includes collaboration with instructors at Lenoir Rhyne College, North Carolina State University and the N.C. Research Campus in Kannapolis, N.C. The work is supported by an $82,000 grant from the N.C. Biotechnology Center to Professor Allan Brown of the N.C. State University Plants for Human Health Institute. 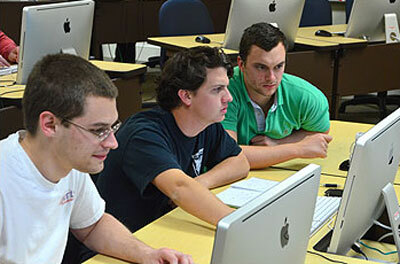 (l-r) Blueberry researchers Austin Mudd '13, Mark Angel '13 and Tim Keating '13 conduct their work on computers rather than in the field. The United States is the world’s largest producer of blueberries, harvesting a total of 564.4 million pounds in 2012 worth $850 million. They are low in calories and high in nutritional value as a source of anti-oxidants, dietary fiber, minerals, and vitamins. They have always been abundant in North America, and were a staple in the diet of Native Americans and colonists. The student researchers at Davidson are working to identify specific genes in the blueberry’s genome of about two billion nucleotides that can be selected to produce plants with desired characteristics such as larger berry size, more weather tolerance, more disease resistance and sweeter taste. For most of human history, growers tried to produce better plants through time-consuming selective breeding, which requires growing blueberry bushes large enough to produce fruit. But genomic science now allows prediction while the plant is just a tiny seedling of which strains of plants should express desired characteristics. The genomic investigation can therefore save considerable time for breeders. Davidson biology professor and Martin Genomics Program Director A. Malcolm Campbell’s students are conducting this original research in their “Laboratory Methods in Genomics” class. Each student has identified up to 100 or so genes, and is investigating their contribution to desired traits. Students identify genes from related plants such as grape and strawberry, and use computers to identify similar genes located in the blueberry genome. Once they have identified the blueberry genes, they collect short DNA segments that breeders can use to identify which version of these genes are in the different plants they breed. The work of the Davidson students this semester should facilitate the project at Lenoir Rhyne University, which will begin in the fall. The students will eventually report their findings to their collaborators at NCSU, the U.S. Department of Agriculture in Maryland and Washington State University. Their annotation of gene structure will also be part of a scientific paper that will be written about the project. Campbell and Assistant Professor of Biology Scott Schaefer from Lenoir-Rhyne will also use their students’ experiences to develop resources, tools, tutorials and web interfaces to develop plant genomic courses to be offered at other colleges and universities. The outcome of the students’ research has benefits beyond helping produce to a better food and commercial product. It is also preparing the student scientists for careers in biotechnology. They are learning how to search a genome, identify genes of interest, compare gene sequences from different species, and identify repetitive DNA segments within the plant genome. They have also been troubleshooting some software to improve its usability by other researchers and students. In the meantime, will the Davidson students get to taste the fruits of their labor? They raised their concerns about the situation to Professor Campbell. He understood their frustration, and responded as best he could. “It’s not blueberry season yet, but one afternoon I did take them all over to the local coffee shop for a blueberry scone!” he said. Davidson is a highly selective independent liberal arts college for 1,900 students located 20 minutes north of Charlotte in Davidson, N.C. Since its establishment in 1837 by Presbyterians, the college has graduated 23 Rhodes Scholars and is consistently regarded as one of the top liberal arts colleges in the country. Through The Davidson Trust, the college became the first liberal arts institution in the nation to replace loans with grants in all financial aid packages, giving all students the opportunity to graduate debt-free. Davidson competes in NCAA athletics at the Division I level, and a longstanding Honor Code is central to student life at the college.